Falkirk, Scotland based Horizon Reinforcing and Crane Hire has taken delivery of its first Grove crane – a 300 tonne GMK6300L All Terrain. The six-axle GMK6300L features a seven section, 80 metre main boom and a 29 metre bi-fold swingaway extension an boasts a 120 metre maximum tip height. Features include Megatrak independent suspension and all-wheel steering. 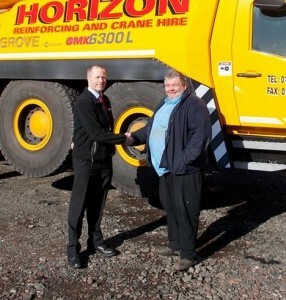 Run by the Dougall family, Horizon has a fleet of 12 cranes which is topped by the GMK6300L. Established in 1973 the company also deals in the steel reinforcing industry.